Well, it's named for my breed, but other dogs can get it. The skin condition known as collie nose isn't limited to collies. Various diseases can cause this nose nastiness. If your dog's nose becomes lighter because of loss of pigment, or if he has sores or crusting, take him to the vet for diagnosis and treatment. This type of collie nose is caused by too much sun exposure, worsening during the summertime. Relatively rare, this dermatitis causes inflammation and ulcers on the skin of the nose, sometimes extending to the bridge. This autoimmune disease usually affects the dog's face and nose, rather than the whole body as with systemic lupus. Your dog's nose begins losing pigment, and scabs and scaly skin then appear. The skin on the nose appears smooth, without the typical texture. Your dog develops sores moving up the nose's bridge, onto his muzzle. Because of light sensitivity, your dog might be more affected in the summer. In some dogs, other parts of the face also lose pigmentation. Females tend to be more affected than males. 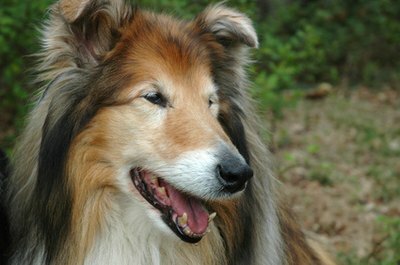 Depending on the severity of the problem, your dog might or might not be bothered by collie nose. A more serious type of this disease, systemic lupus erythematosus, can also cause collie nose symptoms, but your dog's entire muzzle becomes encrusted and inflamed. The immune disorders pemphigus erythematosus and pemphigus foliaceus can cause collie nose-type symptoms. In both of these diseases, the body attacks the outer layer of skin -- the epidermis -- resulting in sores, pimples and scaliness. Pemphigus foliaceus is more common and spreads all over the dog's body. Pemphigus erythematosus generally appears on the feet or face. Your dog with collie nose might not have a drop of collie blood, but the disease got its name because although it's not exclusive to collies, it's often seen in them. Shetland sheepdogs, who look like miniature collies, are often affected, but breeds as varied as the German short-haired pointer, Brittany spaniel, German shepherd and Siberian husky also have a high incidence of collie nose. These are the most susceptible breeds, but any dog, purebred or mixed, is vulnerable. Because dogs afflicted with collie nose generally have normal blood counts and urinalysis, skin biopsies hold the clues to what's ailing your buddy. Your vet takes skin scrapings of the sores to determine the cause of collie nose, using the cultures to find bacteria or fungi. Treatment depends on the vet's diagnosis. Keeping your dog out of the sun during hot weather is the easiest way to avoid exposure. Other common treatments include applying sunscreen on the nose -- not as easy as it sounds, since your dog probably will try to lick or wipe it off. Your vet might prescribe oral antibiotics, or topical steroids for affected areas. Even dietary changes can help the condition, especially supplementation with omega-3 fatty acids or vitamin E.
If these treatments don't do the trick, your vet might prescribe oral steroids such as prednisone. That drug is generally used, along with other steroids and medications, if the diagnosis is pemphigus. What Is a Treeing Tennessee Brindle Dog?